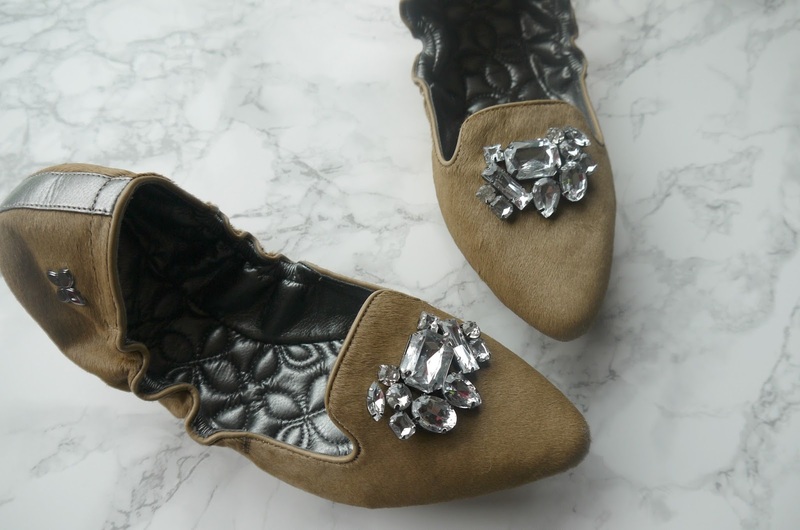 Hello lovelies, so today I thought I would share with you now the prettiest flat shoes I own! Butterfly twists very kindly gave me the option to choose from their new range of shoes they had on their stunning website and I was very spoiled for choice but fell in love with these instantly. For me my choice of flat shoes is either black or brown, they seem to go with everything! These aren't just your average flat brown shoes though are they? 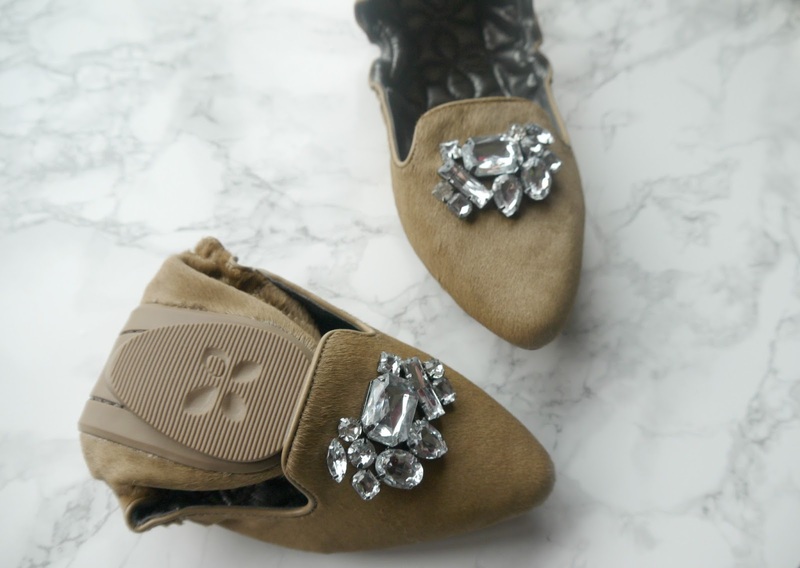 Gorgeous jewel embellishment, soft taupe pony hair and the cutest little heel. Genuine leather and are the most comfortable shoes I have ever wore! I also love the cute little butterfly embellishment on the side of the pump. These are perfect for flinging in your handbag if you're wearing heels for the day like the men who actually designed these shoes! A funny story about the company is that Butterfly Twists had an unlikely start in fashion life. In 2007, two brothers and their two oldest school friends made a bet that saw the unluckiest of them attending a party in a pair of six inch statement stilettos. What started as a joke, however, gave the boys – Emmanuel Eribo, Frank Eribo, Mark Quaradeghini and Philippe Homsy – the idea that would change their lives. A new found solidarity with the women enduring evenings out in towering heels started a conversation about footwear that might deliver a little glamour, without ruining a good night out. While the loser of the bet, who shall remain anonymous, had no desire to reacquaint himself with the practise of wearing women's shoes, he and the circle decided to do their bit for women's feet by launching a new line of flats that combined a little fabulousness with a freedom of movement and consideration for comfort. They didn't have any experience in fashion, or footwear, but one good idea and four enthusiastic workers decided they didn't have anything to lose either. It took two years for the boys to assemble a design team who could combine a consideration for style and luxury with comfort and versatility, and source manufacturers who could patent the featherweight, flexible sole that the brand would become known for. The collection debuted in London in 2009, dedicated to the aching toes and glamour-cravings of its most stylish inhabitants. The boys don't wear women's shoes anymore, but if they did, they would make a pair of Butterfly Twists their first choice. I understand why now, I have worn these for going out on a normal day to day or popped them in my handbag when I'm wearing heels because they are so easy to carry around and so well made, my mom is already eyeing them up and saying are you sure you want to keep them aha. Safe to say she will want some for Christmas. It makes your feet feel special being in a hand crafted pump, the cushion feeling around your toes and heel of the foot, it's just a dream to walk in I absolutely love them and looking at adding more to my collection, I have my eye on these beauties . Let me know if you like any shoes from their collection.